Knee-length Buckskin Lederhosen HM-4040 in Light Brown. Theses stylish knee-length buckskin Lederhosen, made from soft and durable light brown buckskin, show natural variations in colour and are lavishly decorated with self-coloured embroidery. Traditional H-suspenders complete the look: they fasten at the waistband with large horn buttons and can be adjusted by the elaborate silver buckles to achieve a perfect fit. Ties at the back of the waist and below the knee also ensure comfort. 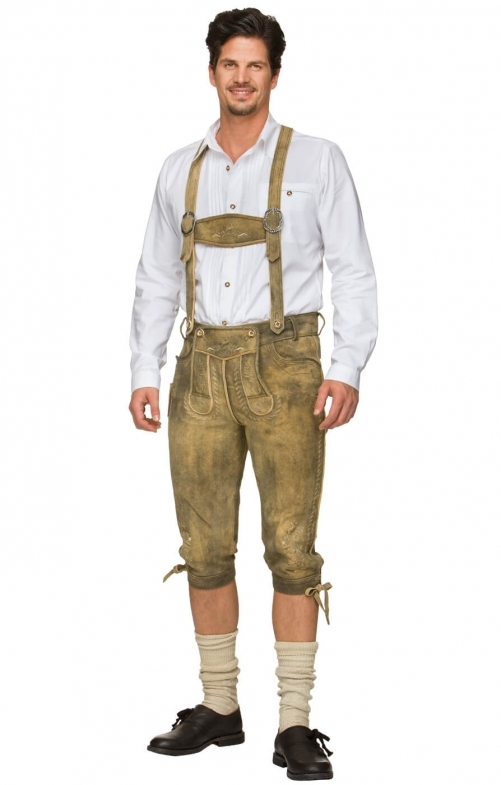 Whether for everyday wear, a wedding or to impress at the Oktoberfest, these high-quality HM-4040 bucksin Lederhosen will ensure that you look your best in traditional Bavarian style.